It was a few days back when I dropped a tweet and, for a lack of a better term, received what seemed at the time, some scorn from someone I respect quite a bit. First off, let’s get this out of the way. Alan and I are former colleagues, respect each other, and message quite often about Braves news and such. He’s a big part of why I still want to write Braves material. Furthermore, it turns out that Alan and I agree on many points regarding BABIP. His rant made quite a lot of sense and I suggest reading it over at Tomahawk Take to educate oneself on the matter. One thing Alan and I might not agree on in regards to BABIP is that it’s a valuable statistic that the Braves have overlooked for YEARS and has caused many a headache for both fans and GMs alike. Batting Average on Balls In Play (BABIP) measures how often a ball in play goes for a hit. A ball is “in play” when the plate appearance ends in something other than a strikeout, walk, hit batter, catcher’s interference, sacrifice bunt, or home run. Important Piece of BABIP: The basic MLB average of BABIP is .290-.300, but it’s more complicated than that as players that use all parts of the field, top-tier speed guys, or even guys with a high hard contact rate can defy BABIP on a regular basis. On the contrary, heavy LHH pull-power hitters such as Brian McCann and Anthony Rizzo will carry BABIPs below the norm pretty regularly due to their hard contact being hit into the teeth of a shift and due to HRs not factored into BABIP. Now let’s get back to the lecture at hand. Chris Johnson, Jose Constanza, Jeff Francoeur, Emilio Bonifacio, Danny Santana, Chase d’Arnaud, and Pedro Ciriaco…some of these guys stories are quite different, some seem like clones, but all have a common denominator that’s earned them quite a chunk of change (over 30 million dollars collectively, but more importantly, roster spots over better players) from the Braves: a BABIP fluke. To start this study off, we will take a look at Chris Johnson, who makes up most of the money in this study and his extension is one of the most notorious in Braves history. In this exercise, we will evaluate Chris Johnson and his 2012 without the Braves and his next 2 years with the Braves. First, we all knew that CJ was a sub-optimal defender at 3rd and that any value he held was going to be held in his bat, but let’s get the baseball cliches out of the way on CJ: He’s a good line-drive hitter that uses all parts of the field and keeps fielders honest. He’s also slow as molasses and needs this skill to stay relevant in baseball. Now let’s look at the juicy details from Fangraphs. Hard contact rate is being used extensively in baseball at this point and exit velocity is being shoved down our throats as the stat du jour. Here’s CJ’s results on his contact rates ’12-’14. In dissecting CJ, he was pretty doggone good at making the most out of his skill-set as his career BABIP is .353. This makes him an outlier for the BABIP stat, but his 2013 is an anomaly of an outlier. Unfortunately for the Braves, he was extended after his career year for 23.5 million and has had negative $ value since. For Chris, the BABIP fluke was the gift that kept on giving for years and has set his family up for the long haul. For others, it’s extended their careers and unfortunately, it was mostly in a Braves uniform. OOPS! Your HIGH BABIPs went MISSING! 1. Jeff Francoeur received years of undeserved playing time from the Braves riding on the coat-tail of his hot start that was highly aided by a .452 BABIP his first month in the bigs. 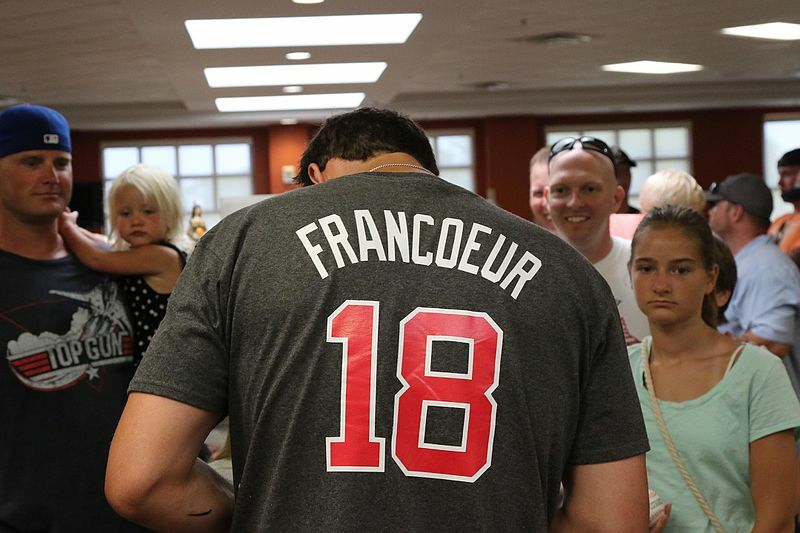 Braves weren’t the only ones that were fooled as he quickly donned the cover of Sports Illustrated, was deemed “The Natural,” and the question was posed, “Can anyone be this good?” The simple answer is Frenchy couldn’t. His ‘07 year was quite good, but ‘08 through half of 2010 were absolute disasters. It took 2.5 straight years of well-below average production before Braves front office pulled the plug and traded him to the Muts for Ryan Church. 2. Jose Constanza was given starts over Jason Heyward due to his hot start that was seriously aided by a .403 BABIP his first 24 games. The Constanza love affair lasted 4 years and he collected .1 fWAR the rest of his Braves career after that hot start. 3. Pedro Ciriaco’s first 60 plate appearances were quite good as he posted a .768 OPS as a fill-in around the diamond and pinch hitter. The problem was that it was aided by a .375 BABIP and his production fell off a cliff after that, yet he still racked up plate appearances…91 of them with a putrid .535 OPS. 4. Chase d’Arnaud was given 170+ more plate appearances in 2016 due to the fluke that was 92 plate appearances of an .855 OPS seriously aided by a.426 BABIP. His last 170 PAs… .526 OPS. Conclusion: Ender’s career is young, but he’s fast and could benefit from his legs by some bunt hits. I’d expect an upturn in his BABIP, but wouldn’t expect the power he’s shown to continue. Therefore a mid-.700s OPS is a good bet. Conclusion: BP’s career numbers speaks more volume than his current BABIP. I expect him to stay in the .700ish OPS range. Conclusion: I wouldn’t expect FF5 to keep up his current HR pace, but make no mistake I could see him keeping up his current BABIP numbers (or even surpass them) due to his hard contact rate. Conclusion: Kemp has had one year where his BABIP sustained a .380 mark for the year and that was his MVP year. To think he can duplicate that doesn’t seem like a smart wager, but he’s carried a high BABIP for his career. It wouldn’t surprise me if the friendly confines of Suntrust Park aids his BABIP to keep it north of .350. Nick Markakis: career: .317 current: .368 Conclusion: Nick’s power stroke hasn’t shown up yet, but he’s squaring up balls on the regular. I’d expect the BABIP to drop down into the .330s but come close to maintaining his overall slash-line. Conclusion: T-Flow has been a tireless worker on his swing the past 2 years and has drunk himself full of Kevin Seitzer’s approach. His swing looks so short and structured right now that the ability to outperform a league average BABIP is a near given. With that in mind, there’s simply no way his current .478 BABIP is sustainable, however, I wouldn’t doubt that in a career year, T-Flow could push .400. Expect his current BABIP to regress but still be well above league average. Conclusion: Dansby’s career is young and his contact hasn’t been great, but nothing is falling for him. His BABIP will improve and Braves fans will rejoice. Conclusion: Suzuki is not a good hitter and hasn’t been for his career. However, he’s been unlucky and numbers should improve a bit. Conclusion: His BABIP will get better, but it’s not going to help him be a player worthy of a roster spot. Conclusion: Santana has speed and could be a decent bench piece were he not sitting alongside Bonifacio who is a future him. His numbers will get better but it’s not going to help the Braves bench as long as there are 2 of him. Conclusion: It’s tough to watch Jace right now as I’ve long been a fan of his skillset, but his power just hasn’t developed and his hard contact is low. He could boost his BABIP by adding bunt hits, but hasn’t done that often yet. He likely sits as a mid-600s OPS guy with the ability to push it up in the .700s against RHP. Starling Marte (19th at 358).